Based at Forthill Community Sports Club in Broughty Ferry, ion8 Forfarshire Cricket Club runs four senior teams and a thriving junior section with teams at under 18, under 16, under 14 and under 12 levels. Qualified coaches provide all year round high quality junior coaching for boys and girls. ion8 Forfarshire 1st XI plays in the Cricket Scotland Eastern Premier Division, finishing 2nd in 2018, while the 2nd XI play in the North East Championship which they won in 2015. Forfarshire's 3rd and 4th teams play in the SPCU with a focus on enjoyment, player development and young players making the transition from junior to senior cricket. Significant improvements have been made to club facilities at the Mackays Forthill ground in recent years, with a custom built three-lane indoor practice facility completed in 2017 in addition to a new electronic scoreboard. A hospitality marquee and barbecue area has rejuvenated the match-day experience for players and spectators alike. 2018 saw complete refurbishment of the pavilion bar and function suite to create a modern multi-purpose facility. The club welcomes all ages and abilities whether as a player or spectator - click on one of the links below for more information. Forfarshire completed a 10 wicket win over visitors Poloc in Saturday’s warm-up match. New overseas amateur Josh Thompson collected his first wicket in Forfarshire colours and along with a wicket for Christian saw Poloc ease their way to 42 for 2 after 10 overs. Two economical wickets for Brock left the visitors 55 for 4 after 17 before Glenn (4 for 21) and Graeme Black (2 for 14) combined to see Poloc lose their last 6 wickets for just 19 runs on their way to 97 all out. Sunday saw Forfarshire 2nd XI take to the field for the first time this season when Largo made a welcome return to Forthill. Unbeaten half centuries from Greig Gemmell and Richard Rennie along with a fine 43 from Fergus Duncan helped Forfarshire up to 197 for 6 from their 40 overs. 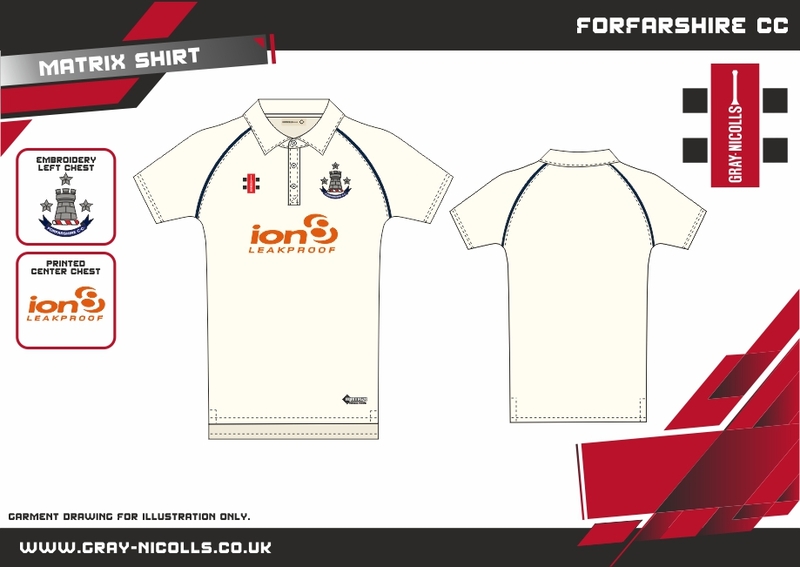 ion8 Forfarshire playing, training and leisure kit is now available to order - it's all new for 2019 and supplied by Gray Nicolls. Forfarshire's 3-lane indoor net facility is available to hire by clubs and organisations. Use the Contact Us page to ask about availability and rates. Forthill's newly renovated Function Room and Bar area is available to hire. This superb new multi-purpose space is suitable for all kinds of events - use the Contact Us page to ask about availability. Register with EasyFundraising and help raise funds for the Forfs every time you shop online - at no extra cost to you!